The full text of both books in the Dot-font series is now available for free download. There are three digital formats: a plain-text version, a Microsoft Word file, and a PDF edition has been designed for easy reading onscreen. These free editions do not include the illustrations from the printed book, but they contain the full text, including index. These digital editions are published under a Creative Commons license. For more about this project, take a look at this post and this post on my blog, Easily amused. Talking about type & design — live! On April 25, I was interviewed for a podcast on design by Uta & Chris Ritke of 49Sparks. I had just spoken to Jean-Benoît Lévy’s typography class at San Jose State University, where the students were studying newspaper design. Jean-Benoît had given his students a class project: to re-design the Street Sheet, a monthly tabloid newspaper produced by and for the homeless population of San Francisco. Uta and Chris had previously done a podcast about this class project, showing Jean-Benoît’s students trying their hands at hawking the Street Sheet on Market Street and getting a direct sense of what the paper was for and what its design had to do. On Thursday, March 22, 2007, Wessel & Lieberman Booksellers, in Pioneer Square in Seattle, will be hosting a reading and book launch for the first two Dot-font books. Everyone is welcome at this free event; you are explicitly invited. Books will be for sale, of course, and I’ll do a short reading from a couple of essays in the two books. 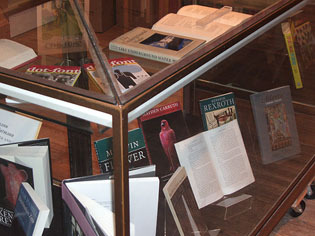 During the months of March & April, an exhibit of my twenty-odd years of book design will be on display at Wessel & Lieberman. The show runs to April 30. It showcases everything from the books of poetry that I designed for Copper Canyon Press in the 1990s to the complex visual projects I’ve done for Marquand Books and Mark Batty Publisher This will be the first time my book designs have been exhibited together. Please come and take a look. I began writing the “dot-font” column for the portal website Creativepro.com in the summer of 2000, dealing with the ongoing changes in the world of design and typography and putting them into perspective. The essays in the Dot-font books were all published on Creativepro, originally to a weekly deadline and later at a slightly more relaxed pace. I wrote them for the general community of people interested in type and graphic design, and for anyone who might either be using type or be curious about it. In that time, the column has attracted a certain following. Design is an amorphous subject, and an ambiguous but highly useful profession. The purpose of design is to give clarity and form to the shapelessness of everyday life – or at least to create some structures that help us navigate within the everyday chaos. Maybe that’s why it’s so hard to pin down any particular definition of “design.” Plenty of designers and nondesigners have promulgated theories and manifestoes, but what matters is their practice.